The Ravens' second preseason game played out much like the first, but with a much more exciting finish. A few of the offensive starters got their first game action, but starting quarterback Joe Flacco still sat. The first-team defense gave up a long drive for the second consecutive week, this time to quarterback Andrew Luck and the Colts' first-team offense, but again kept them out of the end zone. The Ravens offense got in gear after a sluggish start. Various rookies made their impact felt. And, for the second straight game, the Ravens came away with a win, beating the Colts, 19-18, at Lucas Oil Stadium Saturday night. Colts punter Pat McAfee's 62-yard game-winning attempt fell short as the final seconds ticked away. The Ravens won in a particularly unusual way as safety/linebacker Anthony Levine picked off a two-point conversion attempt with less than four minutes remaining and took it all the way back down the field to give Baltimore two points and the lead back. Whereas Baltimore's running game led the way in the first preseason victory against Carolina, the passing attack did the damage Saturday night. In his second straight start, Ryan Mallett was solid once again. Third-string quarterback Josh Johnson was equally, if not more, impressive. The preseason victory doesn't really matter in terms of standings, but it's the first time the Ravens won in Indianapolis in franchise history. The Ravens had played there six times previously (never in the preseason). With the Colts' first-team offense driving on a second-straight possession, linebacker Albert McClellan punched the ball out of tight end Dwayne Allen's arms and safety Eric Weddle pounced on it. Baltimore's starting offense turned it into a touchdown to take the lead as wide receiver Kamar Aiken drew a 41-yard pass interference call, then took a 14-yard catch into the end zone. Third-string quarterback Josh Johnson took over with less than two minutes left in the first half and put together a 79-yard drive in which he went 8-for-9 and hit wide receiver Jeremy Butler four times for 35 yards, including a beautifully lofted 12-yard touchdown pass. Fourth-string quarterback Jerrod Johnson was picked off on his first drive to open the second half, and the Colts turned it into a touchdown. On fourth-and-goal from the 1-yard line in the third quarter, Colts quarterback Scott Tolzein hit wide receiver Tevaun Smith on a slant in front of safety Julian Wilson. Rookie outside linebacker Matthew Judon got a sack on the following two-point conversion attempt to keep the Ravens ahead, 14-12.  McAfee's 62-yard game-winning attempt fell short as the final seconds ticked away. After the Colts took an 18-17 lead with less than four minutes left, Levine intercepted the pass on the two-point conversion and ran it back for a game-winning score. A touchdown scored by the defense on a two-point conversion counts as two points for the defense. The Ravens suddenly went up, 19-18, and got the ball. Johnson got into quite a rhythm in the two-minute drive to end the first half. He hit rookie Chris Moore and Butler on multiple completions to the sideline before providing the perfect touch on his touchdown pass. After Jerrod Johnson struggled, Josh Johnson came back into the game and delivered a field-goal drive and a few scrambles to hold on for the win in the fourth quarter. The Ravens will return home to face the Detroit Lions in their third preseason game. It could be the first and only time Flacco plays in the preseason, along with other starters. 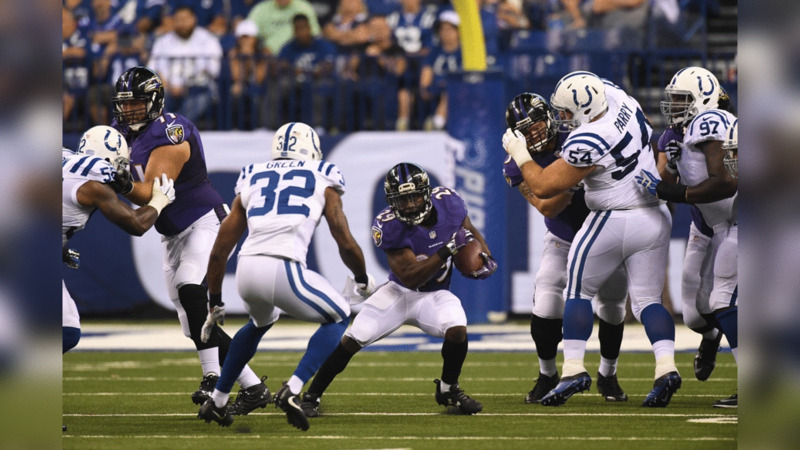 The Ravens travel to Indianapolis to take on the Colts in their second preseason game.